It's a cold world out there for a modern-day spy. The Bourne Legacy takes place in parallel with the events of 2007's The Bourne Ultimatum, picking up the story from a different, wider perspective. Byer (Edward Norton), a high-ranking intelligence officer in civilian clothes who runs a mysterious, CIA-backed program, has been made aware of Jason Bourne's presence in New York City, which threatens other secret government operations. Bourne (played by Matt Damon) woke up as an amnesiac with extraordinary abilities in 2002's The Bourne Identity, and his goal throughout that film and the sequels (The Bourne Supremacy and The Bourne Ultimatum) was to discover his own identity and get to the root of the program, in which he felt he was an unwilling participant. But Bourne is somebody else's problem; Byer sets in motion a nefarious plan to neutralize Bourne's threat to his program. He does so without hesitation and with his emotions well in check, running his team, which includes his equally hardened lieutenant (Donna Murphy), with cold efficiency, driving them forward with a common purpose: Deny, deny, deny ... and kill anyone who poses a threat. Thousands of miles away, Aaron Cross (Jeremy Renner) is introduced on a solo training mission in the bitter cold and snow of the Alaskan wilderness. He meets another mysterious man (Oscar Isaac), something happens, and Aaron continues alone, a spy trying to come in from the cold, without knowing why, or much caring, that he's so cold. All Aaron wants -- desperately -- is a fresh supply of medication, which has been supplied to him by the mysterious government program, and is essential to his survival. In search of new "meds" and "chems," he crosses paths with Dr. Marta Shearing (Rachel Weisz), a laboratory researcher he's met before. Something happens, and Aaron and Marta go on the run, with the forces of a vast government conspiracy arrayed against them. Tony Gilroy, who wrote or co-wrote the scripts for the first three installments, has reheated familiar ingredients in the new screenplay, co-written with Dan Gilroy. He's softened the protagonist, making Aaron a more vulnerable character than Bourne, though Marta, as well as Byer and the other government assassins-by-proxy, are cut from the same cloth as their equivalents in the previous films. For his third outing as a director (following the uber-serious Michael Clayton and the much lighter Duplicity), Gilroy has made a film that feels like an action-thriller and looks like an action-thriller, thanks in large measure to the supremely talented Robert Elswit, director of photography. Yet it plays like an old-fashioned, somewhat stodgy spy drama that insists on dotting all the i's and crossing all the t's, even as a man with a machine gun strides slowly and calmly into the room. Without a true sense of urgency, the story runs on the expected rails. The action sequences avoid the "shakey cam" indulgences that previously plagued the series, and, early on, are kept sufficiently brief and sharply-focused to be quite effective. As the sequences lengthen and become more complex, however, they succumb to the dreaded "cut to the beat of a hummingbird's heart" rhythm, the pace deadens, and the staging becomes increasingly incoherent. C'est la vie. So for all the incidental pleasures that are to be derived from the film, especially the empathetic tones wrung by Renner and Weisz, and their mutual sense of forced desperation, by the time the end credits roll, The Bourne Legacy adds up to less than the sum of its parts, a good-faith effort that is polished and professional and proficient and prone to the same pitfalls as any other fourth installment of a series. It's effective enough as a reset button for the franchise, but not sufficiently compelling or narratively satisfying as a stand-alone story. 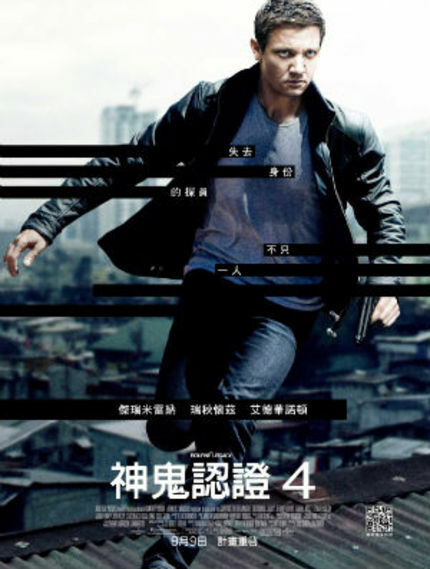 The Bourne Legacy is now playing wide in Canada, the Czech Republic / Slovakia, Hong Kong, India, Malaysia, the Philippines, Poland, Romania, Singapore, Taiwan, Thailand, and the U.S. Check local listings for theaters and showtimes; check the official site for upcoming release dates worldwide. Matt Damon And Paul Greengrass BOURNE Again?